HandKrafted by Stephanie: Mojo Happy Birthday Papa! Hello! It's time for a new Mojo Monday sketch (#176).. this week the sketch is super flexible.. round or square! Today is my Dad's birthday (Happy Birthday, Dad! ), and this is the card we sent to him from Sabrina! I chose a couple of bright and fun patterns from the Echo Park - Little Boy collection. On the green polka dot paper, I clear embossed stars all over from Verve's Polka Stars. 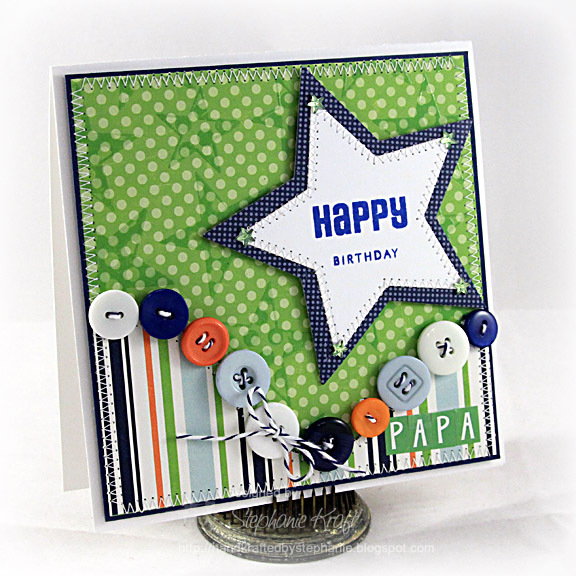 I stamped "Happy Birthday" (from Happy Thoughts) and cut it out using Spellbinders Star Nestabilities. I added some stitching and star rhinestones from Pizzazz Aplenty, then I popped it onto my main panel. I thought it would be fun to add buttons all along the wavy part separating the two patterned papers. I tied some Divine Twine through each button. "PAPA" was spelled using stickers from the same Echo Park collection. Accessories: Star Nestabilities (Spellbinders), Star rhinestones (Pizzazz Aplenty), Buttons (Papertrey Ink), Blueberry Divine Twine, Clear embossing powder, Foam tape, Thread, Sewing machine. wow what a fun card Stephanie! I looove all of those buttons! Hi, my name is Stephanie too! :) I saw your card at the Mojo page today. Such a cute card! Good job! The star & buttons are adorable! Love this card - brilliant colour, super buttons!! And the star is brilliant! Great card! The buttons really make the card pop! Steph, this is so way cool!! I love the stars and the button border along the wave!! Fantastic!! I love this cheerful Birthday card for your Dad Stephanie! The trail of buttons look awesome! I am sure he will thrilled to receive this! Love this!!! Great colors & love the buttons with that big star! OH my goodness - I love this masculine card! How perfectly "male" :) Great job Stephanie! Oh I love all the buttons on this one! So cool! LOVE this Steph!! The papers and stamps ROCK!! Congrats on becoming a Mojo Maker!!! This is so fun, Steph! What a fabulous color/paper combo - and the buttons totally ROCK! Love how you followed the line of the star! Beautiful card and love the design! I just love this card! So fabulous!